Get out of Rome for a day to see more of Italy on this tour to Naples and the ruins of Pompeii. In the port city of Naples, you'll explore on foot to take in the sights of the historical center and the bustling atmosphere of daily life here. 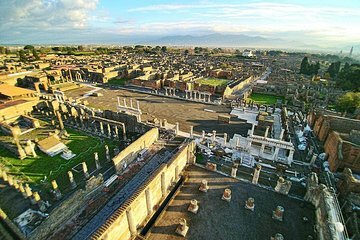 Then continue around the Gulf of Naples to Pompeii, where you'll observe a city frozen in time through the archaeological excavations. Learn about the eruption of Mt. Vesuvius in 79 AD that destroyed this ancient city, covering it in ash.